London has so many sights and attractions. However long you are in the capital for, you will wish it was longer! A great way to get around the sights, at least for part of your trip, is to use a guided bus tour. This is especially good at the start of you stay Ipen they can whisk you around the sights and orientate you in the city. There are three main companies Original London Bus Tours, Big Bus Tour, Golden Double Decker Bus Tours, each offering comprehensive tours, There are many similarities in the offerings and routes, although check which route suits you best. Passes will more bus routes may be better if you know where you want to go, but longer routes may suit you if you want to see everything in one trip! Also note that the Golden Tour Pass is included with certain discount attraction passes for London. This can offer great savings if it fits with what you want to see. What is it? The Original London Sightseeing Bus Tour goes through 6 routes covering all the major attractions in London. It offers live audio commentary on headphone, and also has a live guide on the bus for yellow route. There are 3 complimentary walking tours, a Thames river cruise, and a kids activity pack with the 48-hour ticket. Big Bus tours offers unlimited hop on hop off tours on in three different routes covering over 50 attractions. The tour has a live guide on the bus in Red Route and recorded audio commentary in 12 languages in other routes. The complimentary offer includes 3 walking tours, Thames river cruise, and a voucher booklet with attractive discounts in restaurants and attractions. The Golden Bus Tours offer unlimited hop on and hop off opportunity to discover London at your own pace. The buses offer free Wi-Fi, live audio commentary on the Blue Route, and recorded commentary in other routes. This pass also offers family discounts and complimentary offers like walking tours and Thames River Cruise. The London Ghost Bus Tour service offers a theatrical angle into your sightseeing adventure which shows tourists the dark side of London with a little bit of comedy and horror on board the classic Route master bus of the 1960's. The tour covers the House of Parliament and Westminster Abbey all the way over to St. Paul's Cathedral and the Tower of London, you also get to see the London murder, torture, execution sites, learn about the ghosts and grisly skeletons in the city capital's cupboards. Discover London and its famous top attractions onboard the one and only Routemaster bus with a combined admission to the London Eye and Thames River Cruise. Get onboard the Routemaster bus and see the city through its panoramic windows. The Routemaster double-decker bus offers open-top views in the summer so you don't miss a moment. Learn about the city's attractions and its past with the help of a live guide. See attractions such as St Paul's Cathedral, Westminster Abbey, the Houses of Parliament, Tower of London, and many more. Cruise along the River Thames and see attractions such as the HMS Belfast, Shakespeare's Globe, London Bridge, and many others. Hop-off the boat unto the bus and continue your tour to Buckingham Palace, the official residence of the British Royal Family and take pictures as you witness the Changing of the Guard ceremony. End your tour atop the famous "London Eye", the tallest cantilever wheel for observation in the world and see London from another perspective in 360-degree views like Buckingham Palace, Westminster Abbey, Big Ben etc. Marvel at the London Eye 4D Experience and see London in a whole new way. Please ask the bus official for the last tour time as they vary regularly. March Gate 19 - 20; 7.45 AM and 8.15 AM from 1st April. No bus service on 25th December. Free for children below 4 years. Valid for 24h/48h from the time of first boarding of bus. Both printed and mobile voucher accepted. Free for children below 3 years. 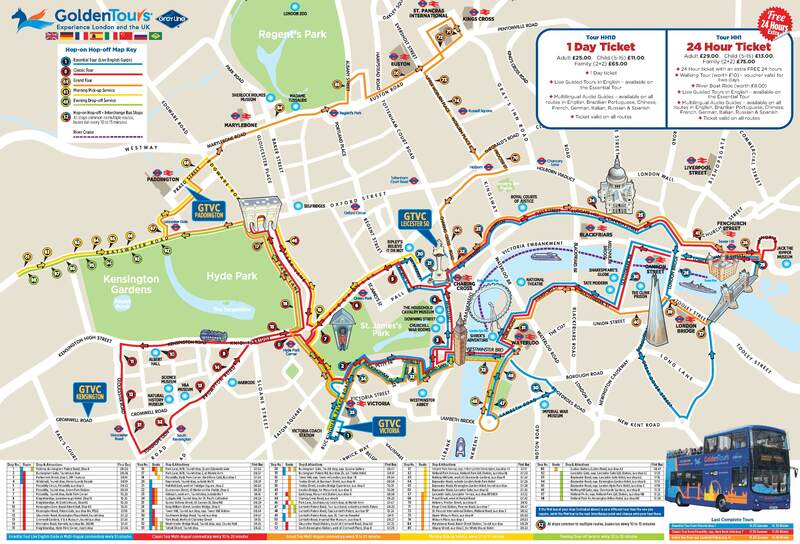 Route changes/disruptions on major events, especially 31st December and 1st January. Thames Boat Ride is not valid on 25th and 26th December. Your voucher is valid for the duration of time specified on your ticket from the date of first use. Tourists can get last minute tickets onboard the bus but must call first to check availability. Cancel your ticket at least 24-hours in advance to get a full refund. Select between morning and afternoon tours, bear in mind that Changing of Guard is only in the morning. Exchange the e-voucher or voucher print out at The Original Sightseeing Tour visitor centre in Trafalgar Square to get your ticket. Show the mobile or printed voucher to the Big Bus employee in the bus. Show your printed voucher to the bus driver. Tourists can exchange their booking voucher for the London Ghost Bus Tour ticket at the starting point near Trafalgar Square in central London. By simply choosing to hand the voucher to the conductor who will exchange it for a ticket valid for 24 hours from the time you get the ticket. Both paper and mobile tickets are accepted. Exchange your voucher at the Victoria Coach Station to get your tour ticket. 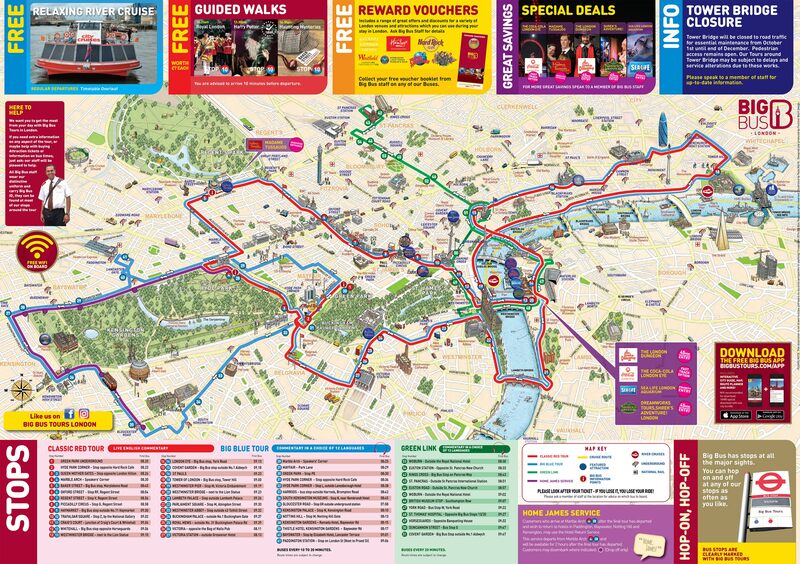 Where to Buy Original London Bus Sightseeing Tour? We are comparing the Best Hop On Hop Off London City Sightseeing tour Prices from leading online Tours and Ticket suppliers, try to find you cheap tickets prices on the market. Where to Buy Golden Hop-on Hop-off Bus Tour? Where to Buy London Big Bus Hop-on Hop-off Bus Tour? Where to Buy London Ghost Bus Tour? Where to Buy Vintage Bus Tour with London Eye & Cruise Bus Tour? London Big Bus Hop-on Hop-off Tour is a travel service allowing tourists to discover London in an easy and time-efficient manner. The bus tour covers all major tourist points of interest in the British capital, giving you an opportunity to explore the city at your convenience. Whether you will ride in circles, take off at specified stops and continue the tour later, it's up to you. The Big Bus sightseeing tour adapts to your needs, not vice versa. See over 50 attractions along 3 bus routes. Listen to pre-recorded commentary in all major languages of the world. Listen to live commentary in English on the Red Route. Take an additional walking tour and a cruise on the Thames River. See the top attractions of London, including the London Eye, Tower of London, Paul's Cathedral, Westminster Abbey and the Buckingham Palace. With the specified ticket, benefit of the priority entry to the London Eye. A free walking tour of the London city center. The Thames River cruise, either return trip or in one direction, depending on the chosen ticket. With the ticket, you receive a voucher booklet with discounts at certain restaurants and points of interest. How much is a 1/2/3 day London Big Bus Tours? Children under 5 years ride for free. We are comparing the London Big Bus Hop-on Hop-off Tour Prices from leading online Tours and Ticket suppliers. Bus stops : Green Park Underground, Hyde Park Corner Stop, Queen Mother Gates Stop, Marble Arch, Regent Street, Piccadilly Circus, Haymarket, Trafalgar Square, Craig's Court, Whitehall, Westminster Bridge, London Eye, Covent Garden, Paul's Cathedral, London Bridge, Tower of London, Embankment Pier, Westminster Pier, Westminster Bridge, Lambeth Palace, Parliament Square, Westminster Abbey, Buckingham Palace, Royal Mews, Victoria, Victoria Station and Mayfair. Bus stops: Green Park Underground, Hyde Park Corner, Queen Mother Gates, Marble Arch, Madame Tussaud's, Oxford Circus, Regent Street, Piccadilly Circus, Haymarket, Trafalgar Square, Craig's Court, Whitehall, Westminster Bridge, London Eye, Covent Garden, Paul's Cathedral, London Bridge, Tower of London, Embankment Pier, Westminster Pier, Westminster Bridge, Lambeth Palace, Parliament Square, Westminster Abbey, Buckingham Palace, Royal Mews, Victoria, Victoria Station, Marble Arch, Mayfair, Green Park Underground, Hyde Park Corner, Hyde Park Corner (outside Lanesborough Hotel), Harrods, South Kensington, Gloucester Road, Kensington Palace, Notting Hill, Kensington Gardens, Thistle Hotel, Bayswater and Paddington Station. Bus stops: Woburn, Euston Station, Kings Cross, St. Pancras, Euston Road, Woburn, British Museum Stop, York Road, St. Thomas Hospital, Horseguards, Duncannon Street and Covent Garden. TripAdvisor Reviews: with the average rate of 4 by its former users, this bus sightseeing service ranks very well. The number of dissatisfied travelers is far below those that are very satisfied. The overall number of reviews is 6100 and 45% of participating tourists rated the bus tour as excellent. Nearly 30% gave a "very good" rate. Spent a lot of time in London over the years, but never took the time to really get to know the city's history. I felt we were extremely fortunate to get Georgie as our tour guide. A charming and passionate speaker, with a truly infectious enthusiasm for all the little facts and details of this big beautiful city. Thanks to everyone at Big Bus tours! It was such a treat. Viator Reviews: If you refer to reviews from Viator, the overall rate is even more impressive - 4.5 by 593 reviewers. Get Your Guide Reviews: Tourists that reserved the Big Bus sightseeing tour through this booking website have rated the experience with 4.4 (212 reviewers) rate. With 3 well-conceived routes covering all tourist points of interest, this convenient bus tour saves you time and money. Additional benefit for travelers is a choice of mode of sightseeing in London. Finally, holders of the pass avail of discounts of restaurants, the river cruise and a walking tour. A big advantage offered by Big Bus Tour in regard to other London sightseeing bus tours is a bigger number of stops. That way, you cover the distance between the stops and certain attractions in less time. Additional convenience offered by the company is free Wi-Fi on board. Is the Big Bus London Hop-on hop-off tour Right for Me? This bus tour offers great sightseeing opportunities for first-time and repeated visitors to London. With provided live or audio commentaries, you won t miss anything essential about the city during your ride. Also, this bus tour is ideal for you if you like discounts regarding dining at restaurants. The Original Bus Tour is the service that allows you to discover tourist attractions of London in a short time. Besides, you can use the tour as a convenient transfer option since most tourist sightseeing points of interest are near available stops. Hence, you can use Original London bus tours for quick transfers and save money and time, you would otherwise spend on the public transportation. Key Point of Original London Sightseeing Tour? You benefit of great freedom of choosing your ideal itinerary. Besides bus tours, holders of the bus sightseeing ticket are free to join 3 walking tours and a river cruise. Discounts at some of the top tourist attractions of London. Flexibility in choosing when and where to take off the bus and continue the ride. Tour of iconic attractions of London, including the Tower of London, Westminster Abbey, St. Paul's Cathedral and Trafalgar Square. Live commentary in English on Yellow Route. Audio commentary in around a dozen major languages on other routes. Complementary pack for kids entertainment and Wi-Fi on board. With the package including the Madame Tussauds, London Eye and the Sea Life Aquarium, you save 35%. With the package including the Madame Tussauds, London Eye and Shrek's Adventure, you save up to 42%. 1-day adult ticket (16+): £32 / €36.75. 1-day child ticket (5-15): £15 / €17.2. 2-day adult ticket (16+): £42 / €48.2. 2-day child ticket (5-15): £20 / €23. Children under 5 years of age enjoy free rides. We are comparing the Best Original London Bus Sightseeing Tour Prices from leading online Tours and Ticket suppliers. Bus stops: Kensington Palace, Baden-Powell House, Natural History Museum, Victoria & Albert Museum, Harrods, Knightsbridge, Harvey Nichols, Albert Memorial and The Royal Albert Hall. Bus stops: Piccadilly Circus / Eros Statue, Trafalgar Square, Buckingham Palace, St James's Palace, Ritz Hotel, Hyde Park, Westminster Abbey, Big Ben, The London Eye, London Dungeon, Westminster Pier, The Tower of London, Shakespeare's Globe and London Aquarium. Bus stops:Victoria, Wellington Museum, Hyde Park, Madame Tussauds, Oxford Street, St Paul's Cathedral, London Bridge, The Tower of London and Lambeth Palace. Bus stops: The National Gallery, Nelson's Column, Trafalgar Square, Big Ben & Parliament, Westminster Abbey, The London Eye, Downing Street, Horse Guards Parade, Piccadilly Circus / Eros Statue and Leicester Square. Bus stops: Ripley's, Believe it or not!, Russell Square, British Museum, Kings Cross Station, St Pancras Station and Euston Station. com: Most of the Original London Hop-on Hop-off Bus Tours users have a high opinion of this sightseeing bus tour. The overall rating of the tour is 4 with around 5000 reviews at this point on TripAdvisor. The number of people that weren t satisfied is within usual limits. Couldn t fault it bought a 24hr ticket upgraded to 48hrs & free river cruise all for £32. Four different routes to see & choice of river cruise, we took the one to Greenwich & return. Very informative plenty of stops to get off & see the sights. Plenty of buses so never had to wait long for one to come along. Definitely worth doing. Viator Reviews: these ratings are even more impressive. The overall rate of the tour is 4.5 by around 2700 reviews. Get Your Guide: Finally, the Original sightseeing bus tour has a 4.3 rate by almost 900 users of the Get Your Guide booking website. With the city sightseeing ticket for this service, you save up to 42% for visiting the participating attractions. Since the tour favors sightseeing over shopping and other "welcoming distractions" along the way, time savings are even bigger. 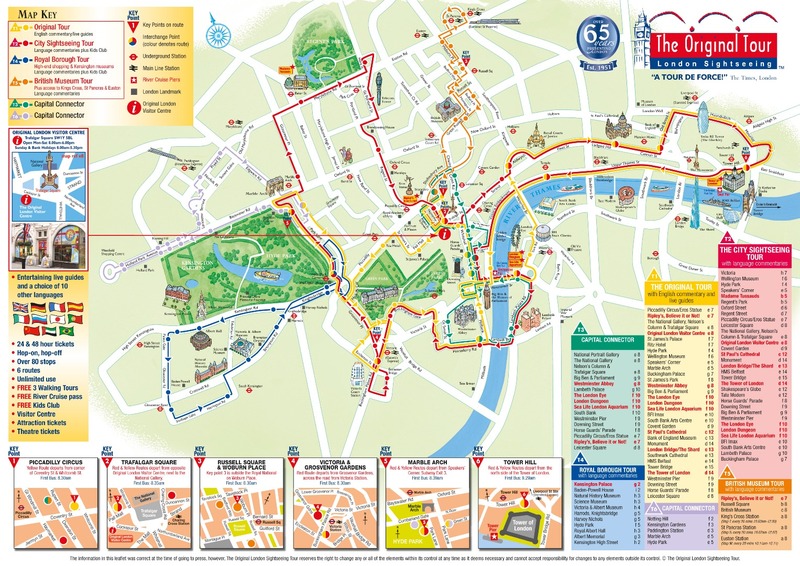 The Original London Sightseeing has 5 routes, which is more than offered by Big Bus (3). That way, you have bigger flexibility in choosing the favorite route and combining ideal itinerary. Unlike Golden Hop-on Hop-Off Tour, the Original Bus Tour has live commentary on one route. This bus service also disposes of a unique channel for children. Is the Original London bus tour Right for Me? The Original London Bus Sightseeing Tour is suitable for first-time and repeated visitors to London. While the adults benefit of complementary walking tours (free of charge) and a cruise, kids receive a pack consisting of games and quizzes. Thus, this is a win-win situation for everyone. The Golden Hop-On Hop-Off Tour is a London bus sightseeing service with several routes covering top and other attractions of the city, it offers a great overview of the destination. More so, you are free to alight at any available stop and continue your tour later. In addition, you become eligible to take complimentary walking tours and a cruise along the River Thames by purchasing the Golden Tour pass. Bonus river cruise and walking tours. A choice among several types of the pass for bigger savings. Visiting top attractions such as the Buckingham Palace, St. Paul's Cathedral, London Eye, Tower of London and Marble Arch. Listening to live commentary on board buses of the Blue Route. Audio commentaries in all widely-spoken languages of the world on other routes. A choice of one guided tour of two with the specified passes. Prices of this provider are cheaper than tours of other providers. Royal London Walking Tour, which lasts between 1:30 and 2 hours, with 2- or 3-day tickets. The Beatles Walking Tour, lasting between 1:30 and 2 hours, with 48- or 72-hour ticket. The River Thames Clipper cruise with the specified ticket. We are comparing the Best Golden Hop-on Hop-off Tour Prices from leading online Tours and Ticket suppliers. Bus stops: Heymarket, Pall Mall East, Duncannon Street, Aldwych (west arm), Ludgate Hill, Queen Victoria Street, Tower Hill, Southwark Bridge Road, York Road, Westminster Bridge Road, Tothill Street, Buckingham Gate, Buckingham Palace, Lambeth Palace Road and Imperial War Museum. Bus stops: Kensington Museums, Marble Arch, Buckingham Palace, Trafalgar Square, St. Paul's Cathedral, Tower of London, London Eye, Piccadilly Circus, Green Park Station, Hyde Park Corner, Knightsbridge (the Lanesborough Hotel), Knightsbridge (At Scotch House) and Kensington Gore/Royal Albert Hall. Bus stops: Buckingham Palace, Marble Arch, Paddington, Madame Tussauds, Kings Cross/St. Pancras International, Russel Square, Holborn, St. Paul's Cathedral, Tower of London, London Eye and Lamberth Palace. Bus stops: Holland Park Avenue (Hilton London Kensington), Holland Park Avenue (Holland Park LUL Station), Noting Hill Gate, Bayswater Road (London Hyde Park Hotel), Bayswater Road, Bayswater Road (Lancaster Gate) and Lancaster Gate. Bus stops: Lamberth Palace Road, Westminster Bridge Road, Tothill Street, Buckingham Gate, Victoria/Buckingham Palace Road, Queen Elizabeth Gate and Lancaster Gate. TripAdvisor Reviews: With the average rate of 3, this bus service is worth booking. Great way to see the main attractions London has to offer - especially if you are time constrained. Covered things like Big Ben, Buckingham Palace Marble Arch, Shopping districts, London Eye and much more. The audio guide is very helpful and informative and if you have good weather it's worth sitting on the top. We tried to do a full revolution of the Blue circuit before we were going to choose where we would ideally want to get off and start exploring but bare in mind because of traffic it took nearly 4 hours just to do that. I d recommend pre bookings your 48 hours pass and planning out each day the night before with 2-3 main areas you want to see and go from there - once you get the gist of your barings aftger the first few days, it's then easy to use the tube and buses around town with the Oyster card instead which ends up being a much cheaper to get about and go even outside of the usual tourist areas. This was my third time in London and I still found it was a great option to see the attractions from a different perspective. Get Your Guide Reviews: Tourists that purchased the Golden Bus sightseeing tour via this booking website rated the service with the 3.9 rate (286 reviewers). With the Golden Bus sightseeing tour, tourists benefit of bus rides, a chosen walking tour and a river cruise. Unlike other London bus sightseeing providers, the Golden Bus Tour provides complimentary shuttle service to and from the city center. With the Family Pass, which is offered by this provider, you are likely to achieve additional savings. Free Wi-Fi on board every bus is also provided. Also, this hop-on hop-off bus sightseeing tour comes with London Pass and London City Pass tourist cards. If you opt for this provider, you ll pay less than with competitive providers. If you are interested in discovering London by land (bus and walking tours) and the Thames River, this tour should be ideal for you. Discover London in a sightseeing Ghost Bus with 75 minutes of fun, fear, and anxiety. Enjoy the creepy conductor's overview of the city's great sights and gruesome ancient history of London and its most popular attractions. Experience the theatrical sightseeing tour aboard the Routemaster, one of the classic buses in the 1960's with live actors on-board and their technical tricks which recreates the horrors and frightening events that happened at the top attractions such as the Houses of Parliament, Westminster Abbey, St. Paul's Cathedral, the Tower of London and many more. You get to see and learn about the city's murder, torture and execution sites; and also London's ghosts and the capital city's grisly skeletons in her cupboard. This is an ideal way to explore London in a fun, and scary way through the nights in the capital city. There are no complimentary tours included in the Ghost Bus Tour. With the London Ghost Bus Tour ticket, you get special discounts and offers on your ticket. How Much is a 1/2/3 Day London Ghost Bus Tour? We are comparing the Best London Ghost Bus Tour Prices from leading online Tours and Ticket suppliers, try to find you cheap tickets prices on the market. The London Ghost Bus Tour departs from outside the Grand Hotel opposite the Sherlock Holmes pub on Northumberland Avenue off Trafalgar Square in central London. The voucher is valid for the duration of time specified on your ticket from the date of first use. Tourists can get last minute tickets on-board the bus but must call first to check availability. Time might change due to local traffic conditions and seasons. Westminster Abbey, Fleet Street, The Tower of London, London Bridge, Houses of Parliament, St. Paul's Cathedral, South River, Cross Bones Graveyard, and Northumberland Avenue. The London Ghost Bus Tour is a fully packed 75 minutes of fun and frightening way of exploring London. This tour is geared towards enhancing the knowledge of tourists in a scary and tricky way. You get to explore London in a classic 1960s original Necrobus (Routemaster) with just a 1-day ticket. The London Ghost Bus's interior is designed in 'railway style” to give tourists comfort and also includes lamps, window curtains which were used to cover reflections and keep the bodies cool if a coffin was left overnight in the vehicle. The London Ghost Bus Tour has live actors on-board, a conductor combined with technical tricks to scare tourists as well as teach them the history of the horrible past of London's gruesome murders, tortures, and executions. The Ghost Bus takes tourists around London with many top attractions insight such as the Houses of Parliament, Westminster Abbey, St. Paul's Cathedral, the Tower of London, Fleet Street, London Bridge, South River, Northumberland Avenue and Cross Bones Graveyard a mass burial site which dates back to medieval times. Is London Ghost bus tour Right for Me? The London Ghost Bus Tour is perfectly right for anyone who wants to learn more about London's gruesome murders and horrific past. It is most suitable for adults and children from 15 years above, this Ghost Bus tour offers tourists the scare of their lives as well as fun and knowledge about London's medieval history. You get to ride in an original Necrobus which is also known as a classic 1960s Routemaster through the London's top attractions such as the Houses of Parliament, Westminster Abbey, St. Paul's Cathedral, the Tower of London, Fleet Street, London Bridge, South River, Northumberland Avenue and Cross Bones Graveyard. The hilarious and creepy conductor, live actors and technical trickery on-board make sure you learn about the gruesome past of these top attractions in London. The long and bloody history of London's top attractions such as the Tower of London which was used for execution of tyrants (and sometimes the innocent) by axe, and also hear the tales of London's hauntings and deadliest diseases. The live actors and conductor also recount the Whitehall Mystery, a 19th-century murder case that was never uncovered and the victim nor killer were never identified, hear about the demon barber also known as 'the butcher” of Fleet Street and many more. Explore London on a 1960's Routemaster bus using a 4-hour hop-on-hop-off bus pass. Travel along the city stops on an open-top double-decker Routemaster with panoramic views of the city's top attractions. Enjoy the wonderful commentary by the live guide onboard in English and marvel at the Tower of London, St Paul's Cathedral, Westminster Abbey, the Houses of Parliament, and many more. Get on the Thames River Cruise and see all of London's famous landmarks from the water such as the HMS Belfast, Shakespeare's Globe, London Bridge, and many more. Get off the boat and continue on the tour to Buckingham Palace and see the Changing of Guards ceremony at the official residence of the British Royal Family. To end your tour, visit the famous London Eye, which is regarded as the worlds tallest cantilever wheel for observation. Take time to enjoy a whole new view of the city as the wheel of the London Eye turns, attractions include Big Ben, Buckingham Palace, Westminster Abbey, etc At the end of the 30 minutes London Eye circuit, you will be immersed in a multi-sensory 4D live-action experience about London's journey so far. Cruise along the Thames River and marvel at the London Bridge, South Bank, and Shakespeare's Globe. There are no complimentary tours included in the Bus Tour with London Eye & Cruise. Lookout for discounts during the booking process. How much is a 1/2 Day Bus Tour with London Eye & Cruise? NOTE: Children from 0-3 years ride the London Hop On Hop Off Bus and Thames River Cruise for free and must be in the company of adults. Where to Buy Bus Tour with London Eye & Cruise Bus Tour? Morning Tour: March Gate 19 - 20; 7.45 AM and 8.15 AM from 1st April. Afternoon Tour: Gate 0 from 1.00 PM. Bus Tour with London Eye & Cruise is a 4-hour tour of London’s most famous and major attractions. The hop-on-hop-off bus pass offers tourists a unique way to see the city in an open-top double-decker 1960's Routemaster bus with admission to the London Eye and Thames River Cruise. The Routemaster buses provide open-tops only in the summer but tourists should expect rain at any moment and on rare occasions, the buses may be changed to a closed top. Also, the Routemaster bus includes a live English guide onboard the bus with fun commentary about all the major attractions such as the Houses of Parliament, Big Ben’s iconic Clock Tower, Prime Minister’s residence at 10 Downing Street, and more. Tourists can get off the bus at the Tower of London and Westminster Abbey stops to take photographs as a souvenir for the tour. The short Thames River boat cruise gives tourists the opportunity to see the city's famous landmarks from the river such as the London Bridge, South Bank, Shakespeare's Globe and more. After the cruise, tourists can hop back on the tour bus to the Buckingham Palace to experience the Changing of Guards at the official residence of the British Royal Family. The tour ends with a visit to the Famous London Eye, where tourists get to see London from a different perspective as the eye revolves for 30 minutes with a 4D live-action visuals about London. Is the Bus Tour with London Eye & Cruise right for me? This Bus Tour with London Eye and Cruise is right for you! It is a combination of the best ways to explore London. With this bus pass, you get to discover London on a retro Routemaster bus from the '60s. The double-decker buses come with open-top for you to see the city in 360-degree views as you travel past some of the major attractions in London such as the Tower of London, St Paul's Cathedral, Westminster Abbey, the Houses of Parliament, Downing Street where the British Prime Minister lives and so on. You can hop-off the bus at the Tower of London and Westminster Abbey stops for some snapshots and continues your tour on a boat cruise River Thames to see the London Bridge, Shakespeare's Globe and many more. After the short river cruise, you can hop back on the bus to see the Changing of Guards at the British Royal Family's residence "Buckingham Palace". Your tour ends with a magical experience atop the London Eye where you get to see attractions from a rare perspective with a 4D live-action multi-sensory visuals about the city. This is surely the best way you can see London in 4-hours.